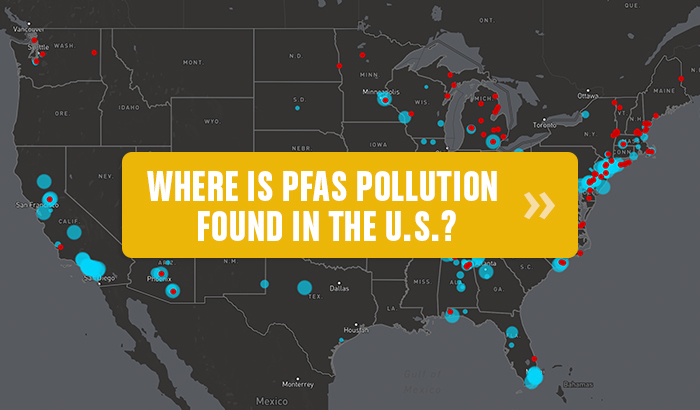 The latest update of an interactive map by EWG and the Social Science Environmental Health Research Institute at Northeastern University documents publicly known PFAS pollution from 172 sites in 40 states, including military bases, civilian airports, industrial plants and dumps, and fire training sites. PFAS chemicals, used in a wide range of consumer products and industrial applications, have been linked to kidney and testicular cancer, liver and thyroid damage, and other serious health problems. When the map was first published in June 2017, it showed 52 known PFAS contamination sites in 19 states. By April 2018, the list had grown to 94 sites in 22 states. A recently released Pentagon report added 78 military sites, including bases in 12 states where contamination was not publicly known before: Georgia, Idaho, Illinois, Indiana, Kansas, Louisiana, Maryland, Mississippi, Missouri, Oklahoma, Rhode Island, South Carolina, South Dakota, Tennessee, Texas, Wisconsin and Wyoming. It also shows PFAS pollution of tap water supplies for 16 million people in 33 states and Puerto Rico. That figure comes from an EWG analysis of tests of public water systems under an Environmental Protection Agency program that ended in 2016. But since then, evidence has emerged that the number of Americans with PFAS-contaminated tap water is much higher. In May, an EWG analysis of unreleased data estimated that more than 1,500 drinking water systems, serving up to 110 million Americans, may be contaminated with PFAS chemicals. The EPA previously said about 200 systems were contaminated, but that number did not include systems with contamination below the agency’s reporting threshold, which is too high to protect public health. In June, the Agency for Toxic Substances and Disease Registry released a report on PFAS safety that the White House and the EPA had tried to keep from publication. The report said the safe level for PFAS chemicals in drinking water should be at least seven to 10 times lower than the threshold recommended by the EPA. Academic researchers say a safe level of exposure is even lower than that recommended by ATSDR.